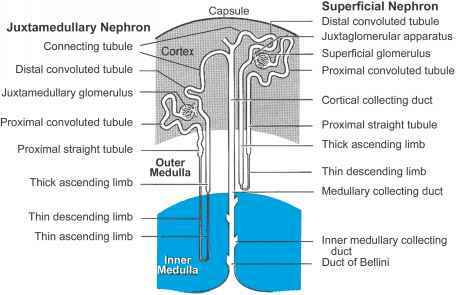 arise primarily from efferent arterioles of juxtamedullary nephrons (see Chapter 23, Fig. 2). The average blood pressure in the peritubular capillaries is only 15-20 mm Hg. This is considerably lower than in the capillaries of other organs because the two series resistances of the afferent and efferent arterioles have dropped it. This lower pressure means that the sum of the Starling forces favors the uptake of water and solutes that have been reabsorbed by the renal tubules, which is the primary function of this capillary bed.